Long ago two kings got together and talked about their loyal subjects. The first king, being pious and prideful, spoke that his loyal subjects would never speak of their own ideas. But, his subjects would only heed his ideas and his ideas only. The loyal subjects knew that to come up with their own creativity and originality could lead to severe consequences. The second king, being a humble and gentle king, thought carefully and wisely before he spoke. And, he explained to the first king, that for him, new and inventive ideas were welcome. And he knew, although he had the final word on things, he had only one mind. But, that ideas and creativity of many minds made for a better existence and future for all. It’s kind of like this unusual and unique heavy duty iron angle bracket, that you see here. You will notice it is different and creative. It is diffidently out the box in imagination. It is not traditional, but at the same time, will perform the duties that a heavy-duty iron bracket must be able to do. And, it is certainly a great example of what the second king would have loved. A large unusual and unique iron under counter bracket, like this one, is obviously not for everyone. But, how fun for those who just want something unusual and unique. 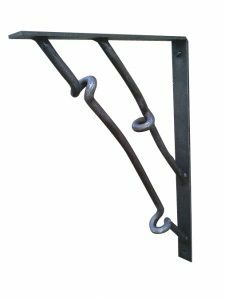 The angle bracket bars freely curve, twists and coil making each bracket individual. And, no two iron brackets are ever exactly alike. It is totally a free form of creative iron in a heavy duty wrought iron bracket. 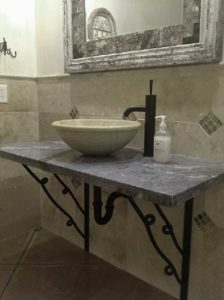 Perhaps you like unusual design in function and can see this awesomeness under your vanity or kitchen counter top. Or, what about an outdoor feature or element in design? This metal angle bracket would truly impress the second king. Now… for the first king….well…let’s just say, as his loyal subject, you would hope it was his idea.